I’ve written expansively about the blog called The Outfit, where Chicago-based crime writers Sean Chercover, Barbara D’Amato, Michael Allen Dymmoch, Kevin Guilfoile, Libby Fischer Hellmann, Sara Paretsky and Marcus Sakey gather to swap ideas, thoughts and gripes. 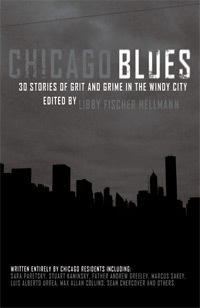 Now Hellmann has put together an extraordinary volume called Chicago Blues, featuring all of her Outfit colleagues and many other Chicago writers. It contains 21 stories, 17 written especially for this collection, at least half of which are top-notch: an amazing batting average in a field where .250 is normal. Other cities have their noir collections: A house called Akashic (dedicated to “reverse-gentrification of the literary world,” as its catalog says) has published volumes ranging from Neal Pollack’s neighborhood-specific Chicago Noir to its latest, Havana Noir, edited by Achy Obejas, in handsome paperback editions. But Chicago is a special case, for crime and blues. Both have had a harder, longer history, and are inextricably connected. The best thing about Chicago Blues is the way it catches the spirit of the blues and the excitement of a well-crafted mystery story. 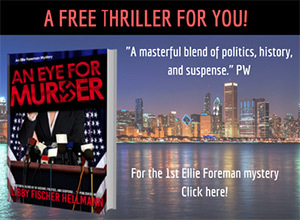 Hellmann, who writes the Ellie Foreman mystery series, tells in “Your Sweet Man” (from a Muddy Waters song) a gripping chronicle of a boy’s tangled relationships with his blues-singer mother, Inez, his dying father and the slick operator who steals Inez away. In “The Non Compos Mentis Blues,” Chercover—whose debut novel, Big City, Bad Blood, earned some glowing reviews and who owns, according to his bio, “more blues albums than can reasonably be justified”—drops his private eye Ray Dudgeon into a case where avoidable murder is played out over just a hint of sad music. Stuart M. Kaminsky, named a Mystery Writers of America grandmaster in 2007 and author of many memorable mystery series, including the Chicago-based Abe Lieberman books, starts his story, “Blue Note” (after a legendary club): “I may not remember the year, but I remember that night when I heard Count Basie and Joe Williams and Sonny Payne going wild for a fifteen minute drum solo.” Telling the story is a young man who is forced to play in—and win—a high stakes, winner-take-all, five-card-stud poker game to keep his blues-singing mother out of serious harm. Guilfoile, whose first thriller was Cast of Shadows, offers the spooky story “O Death Where Is Thy Sting?” in which an avid blues-record collector comes across the only existing copy of a vinyl made by an unknown three-fingered guitar player on the day Robert Johnson (of “Sweet Home Chicago” fame) died, and which is rumored to feature ghostly shrieking. Guilfoile’s story is full of fascinating expert details of the record collecting and selling business (“Any record somebody else wants you to have isn’t worth having”). 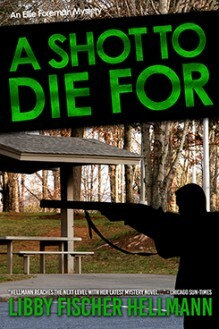 In her first short story to feature her tough and compassionate series hero, private detective Smokey Dalton, Kris Nelscott shifts her to one side and lets the young boy Jim, whose life Dalton saved in Memphis, serve as narrator. It’s a fine addition to Nelscott’s portrait of Dalton as a living library of recent Chicago history. Jack Fredrickson, whose first mystery was the well-received A Safe Place for Dying, explains in “Good Evenin’, Blues” why the narrator calls his blues club The Crossroads: “Chi-Town’s a blues town; lots of folks know the old Delta legend about Robert Johnson meeting the Devil at a crossroads in Mississippi, to bargain away his soul in exchange for becoming the greatest bluesman that ever lived.” The club isn’t doing much business. But a man named Pearly Hester (“dressed like an old-time bluesman in a baggy, pin-striped suit, white shirt loose in the collar, and a floral necktie”) offers a solution that, in the end, comes with its own devilish problems. In “The Lower Wacker Hilton,” D’Amato catches the dark sadness of homeless people as she details the solving of a sad murder by Chicago Police Officer Susanna Maria Figueroa. And Sakey, of The Blade Itself, in a story called “No One,” writes about a blues-loving DePaul University student (“I’ve got Etta and Billie and Dinah keeping me company, the radio tuned to Blues, the only station I get”) who confesses to a crime involving a female student he loves. Chicago Blues is a splendid bedside book, to be enjoyed for a long time. Slip some Muddy Waters or Robert Johnson into your CD player and delight in the best of both worlds.